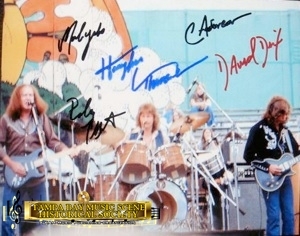 Autographed 1 color photograph of The Outlaws performing live. The photograph features, from left to right, guitarist Hughie Thomasson, drummer Monte Yoho, and guitarist/keyboardist Billy Jones. 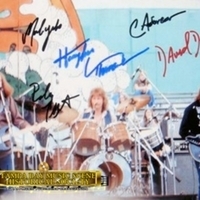 Although the photograph was taken of a much earlier version of the group sometime between 1969 and 1979, the five signatures are from Thomasson, Yoho, guitarist Chris Anderson, drummer David Dix, and bassist Randy Threet, which was the lineup from 2005-2007. Digital reproduction of Original color photograph. http://www.tampabaymusichistory.com/resources/Auto%27s.jpg. Originally published by Ped-Dyn Productions. Copyright to this resource is held by Ped-Dyn Productions and is provided here by RICHES of Central Florida for educational purposes only. “Hugh "Hughie" Edwards Thomasson, Jr., Monte Yoho, and Billy Jones of The Outlaws.” RICHES of Central Florida accessed April 22, 2019, https://richesmi.cah.ucf.edu/omeka/items/show/5471.